Authors of New Stamped Metal Jewelry, Lisa Niven Kelly and Taryn McCabe show us how to Mandala stamp on metal. 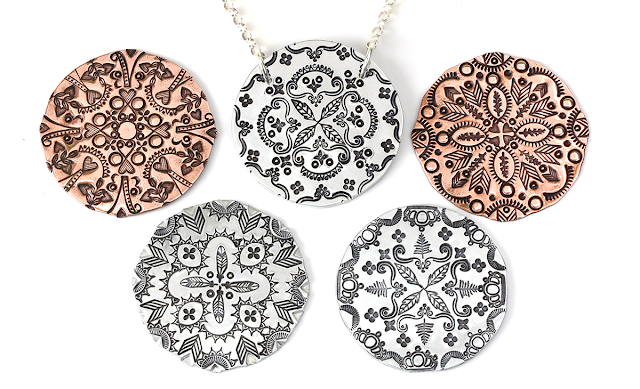 They include a ton of tips for Mandala stamping and will teach you how to make gorgeous necklaces for you and your bestie. Find the stamps used in these pieces here. Hi Ladies! I am Karen from Toronto and I have to say I bought this book and I LOVE LOVE LOVE IT! I have been making mandala necklaces for my business and I am having a ball! A number of designs you can make are endless! Its great to work without any preplanning and then to see what the outcome is is so much fun! Thank you for this video! I love "hanging out" with you and learning more and more new techniques! Ok girls here is my first question! Can you anneal stainless steel blanks?